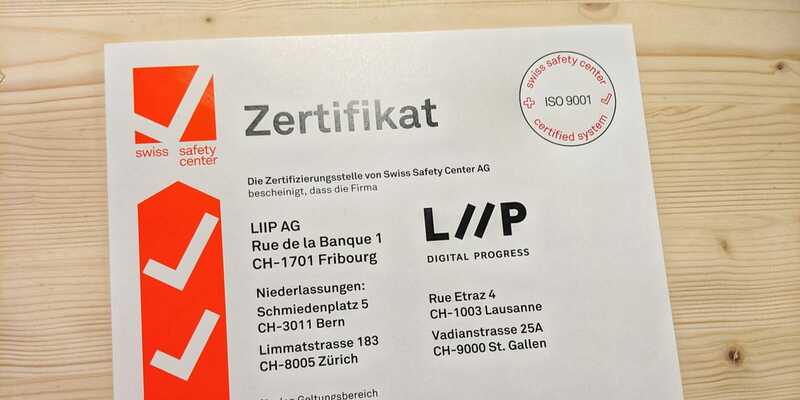 Why ISO 9001 at Liip? With the introduction of Scrum more than 10 years ago, it was clear to us how to ensure quality: through consistent use of agile methods such as Scrum. After years of experience with Scrum and many other methods associated with leading-edge software development, we can claim to have software quality under control. In recent years, however, certificates such as ISO 9001 have become an eligibility criterion for public tenders. No label, no right to participate. Regardless of whether this requirement makes sense or not, certification became urgent. The certification project started in early 2018, two years after the introduction of Holacracy® at Liip. The basis for the certification was exclusively the prevailing Holacracy® governance; in our case it was mapped in the Holaspirit software. We made our entry into ISO through TQMi, a tailor-made ISO template set for IT SMEs. Although we did not use the TQMi templates, we did use the grouping of standard topics that was thematically suitable for us. Along the TQMi chapters we have basically identified two ways to implement requirements: through the rules of the Holacracy® constitution or through our own governance, i.e. Holacracy®'s on-board resources such as roles, circles, expectations or binding guidelines. Right from the beginning, we were well positioned to meet the standard requirements. The challenge was rather to find a suitable way of mapping TQMi or ISO to our existing - or in a few cases new - governance. The three formal means - norm compliance through reference to the Constitution, reference to our own governance and accountabilities for entire chapters of circles - were then quite lean in implementation. In general, ISO 9001:2015 and Holacracy® are a good match. Both pursue an approach of continuous improvement through inspection and adaptation. With very few exceptions, ISO also does not assume a hierarchical structure. And both ISO and Holacracy® demand clarity about expectations of a role and the metrics associated with it, and a clear process for tackling change. And even though we initially dismissed certification as a "contre cœur" necessity, we can now say that it made us better. Even though certain formats (such as the management report) may seem inappropriate for our organization, we have been able to uncover certain but relevant blind spots.